The Grove at the University of Mississippi. Pinterest photo. Last week we discussed the Fan Index Poll of the top 10 tailgates at college campuses across the nation, specifically the rankings from 10 – 6. This week we will examine the top five college tailgates and the may reveal some surprises. #5. South Carolina Gamecocks: Williams-Brice stadium is the home to the Gamecocks famous tailgate located in the heart of Columbia. The uniqueness of this venue includes 22 luxury train car positioned just outside the stadium. Fans fill the Cockabooses every Saturday during the season. #4. Wisconsin Badgers: Located in Madison, Wisconsin, Camp Randall stadium is where fans enjoy the home game’s Badger Bash. The 2 ½ hour event is open to the public and boasts free admission. Game on! #3. Alabama Crimson Tide: The Quad on the Tide’s campus is the perfect setting for the game’s festivities. Bar-b-que, tents, tables, lawn chairs, and friends are all that’s needed to enjoy this event that begins at 6:00pm Friday before every game day. #2. Louisiana State Tigers: The cavernous Tiger Stadium in Baton Rouge is home to one of the most unique tailgates in the country and has been voted #1 in the past. The distinctive culture, variety of incredible food, and the hometown hospitality of the people make this an unforgettable experience. #1: Ole Miss Rebels: Surrounded by oak, elm, and magnolia trees, the world renowned Grove is a 10 acre sanctuary located in the heart of the Ole Miss campus in Oxford. 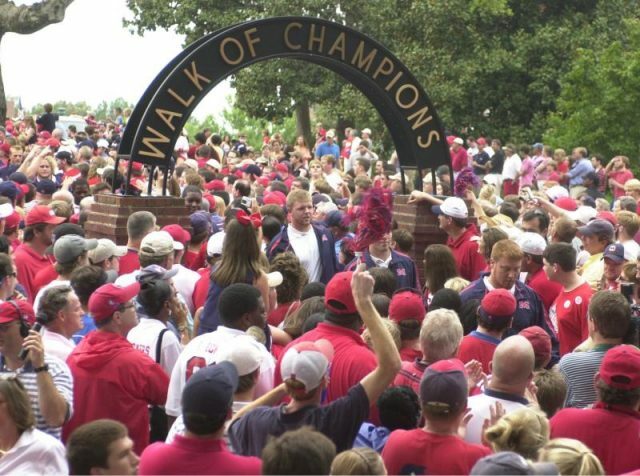 Both home and away games are celebrated on this beautiful part of campus with traditional Southern food and the Hotty Toddy cheer! Did your team make the list? If not, tell us why it should! Next articleSo, Figure it Out – Who’s Zoomin’ Who?